Check out our video showcasing our selection of embroidery and printing methods. Talk to our team to discuss which method will suit your job the best. 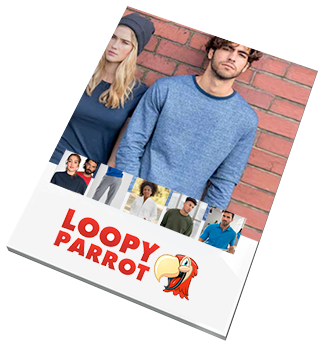 Loopy Parrot – Personalised Garments and Merchandising for Trade and Leisure. Loopy Parrot has over 10 years experience in the print and embroidery industry. As a family run business we are dedicated to ensuring that our customers’ expectations are exceeded. We invest heavily in machinery and equipment to offer more than many other print and embroidery companies. Whether you are looking for personalised workwear, sport or team kits, club, charity or band merchandising, school uniforms, stag and hen party t-shirts, mugs, umbrellas or bags we can help you. When changing my business name from a franchise to an independent business I required a full set of new clothing to be embroidered and printed. Greg from LOOPY PARROT Ltd. took the logo and within a matter of days had it digitised ready to go. After trying on a selection of supplied clothing to get the sizing correct we settled on a range of different garments. Once completed they looked fantastic. Even when a couple of the items had manufacturing issues Greg replaced the items free of charge within a couple of days. I cannot praise Greg and Maria highly enough, they provide an excellent service at a reasonable cost. I will be recommending LOOPY PARROT to everyone I know who needs garments or gifts that require embroidery or printing. Thank you Greg and Maria. We have been using Loopy Parrot for around 6 months to supply our work clothing and either print or put our embroidery on them. The clothing supplied has always been good quality and lasted well as our job demands being on site every day. The prints on our clothing have always stayed intact and showed no signs of cracks, peeling or d=fading. The embroidery is also to a very high standard with the colours standing out and staying vibrant and all the details looking neat. Not only in the quality of the product fantastic but the service you receive is brilliant as well, providing good advice on suitable garments and offering a fast turnaround. I would not hesitate to recommend Loopy Parrot to anyone. We have been using Loopy Parrot for all our work wear for the past couple of years. I am always impresses with the quality of the garments, the embroidery and printing is always of very high quality and we have found Greg very professional and easy to deal with. Loopy Parrot have always provided a promt service even at short notice with competitive prices. I would not hesitate to use Loopy Parrot again in the future or recommend them to anyone looking for personalised clothing.